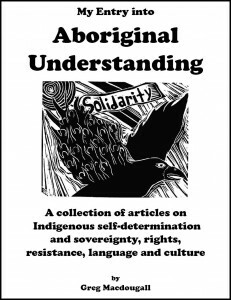 A collection of articles on Indigenous self-determination and sovereignty, rights, resistance, language and culture — all put together in a booklet form for better reading, and also in order to share in the physical world. In two PDF versions (for either front-to-back reading, or formatted to print doublesided and fold into booklet form). Niigaan: In Conversation is a grassroots project that brings Indigenous and non-Indigenous peoples together for dialogue and discussion through workshops and symposiums. The most recent Niigaan event was the Odawa Community Talk-Show on Sept 15. – The Sixties Scoop was a period of Canadian child welfare policy during which an estimated 16,000 Indigenous children were removed from their homes and adopted into non-Indigenous homes. – Includes video interview with CEO Simon Brascoupé. Final (former) CEO Simon Brascoupé on the work NAHO had been doing and what it will mean now that the organization has been closed due to a federal government 2012 budget funding cut decision. “The important thing that I do want people to understand is that this is not an Aboriginal problem, this is not just for Aboriginal people to address. The issue of the impact of residential schools upon this nation is an issue that the nation as a whole needs to address…” says Murray Sinclair, Chair of the Truth & Reconciliation Commission. Idle No More started in Saskatchewan in November, and caught on through social media. … Chief Spence started her fast as the Idle No More movement continued to gather steam. She seems to have taken the lead from the grassroots people, and in turn they have taken her lead. I’ve been working with Taiaiake Alfred to produce a pamphlet for the Idle No More movement. It’s of a piece he and Tobold Rollo have written, entitled “Resetting and Restoring the Relationship between Indigenous Peoples and Canada” and we’ve got it in three different languages. — includes video interviews with Bridget Tolley and Kristen Gilchrist of FSIS, and with Michele Audette, president of Native Women’s Association of Canada. Since January 31, 2011, 100-year-old trees have been cut, animals have died, and the living legacy of a potentially 10,000-year-old cultural site is being destroyed.All this is occurring despite broad-based opposition from a coalition of local residents and community associations throughout the city, Algonquin First Nations communities, and several high-profile national organizations like the Sierra Club Canada and the David Suzuki Foundation. Workshop put on by Jessica Danforth of the Native Youth Sexual Health Network. On March 18th, an Ottawa resident along with a co-defendant from the Algonquin community of Barriere Lake will go to trial in a Maniwaki court on charges of obstruction of justice, mischief, and assaulting a police officer. On March 31st, three other local residents will be sentenced after pleading guilty to mischeif and obstruction of justice. Their crime? Bringing attention to the fact that the governments of Quebec and Canada have not honoured their word. Both cases stem from a series of peaceful highway blockades mounted in late 2008 by the Mitchikanibikok Inik (Algonquins of Barriere Lake, or ABL), a small First Nation community located 130 km north of Maniwaki, Quebec. Solidarity activists from Ontario and Quebec joined the Mitchikanibikok Inik in two successive blockades of Highway 117, which were staged to protest the provincial and federal governments’ ongoing violation of an agreement signed with ABL over a decade ago. In November of 2008, Indigenous activists and allies from across Canada came together in Winnipeg to form Defenders of the Land, a network of Indigenous communities and activists in land struggle across Canada. Out of this network came a call for a pan-Canadian event, Indigenous Sovereignty Week, which is now upon us. Close to 30 cities and communities across Canada (and even a few in the United States) will be holding public events from Oct. 24 to Nov. 1. The purpose of this week is to build local relationships between groups and individuals, disseminate ideas and generally contribute to building a cross-Canada movement for Indigenous rights, self-determination, and justice that is led by Indigenous communities but with a broad base of informed support. The author, Gordon Shawanda, has given permission to make this book available here (and on the IPSMO site) for download at no cost for all aspiring students of Anishnaabemowin (Ojibwe language). It is divided into 18 lessons/themes. Seven guests discussing Indigenous-settler relations, Indigenous naming, the Nepean Redskins name, and what decolonization means. Length: 1hr. Speakers (left-right): Jennifer Adese, Alexa Lesperance, Neal Freeland, Ed Bianchi, Jean-Luc Fournier, Ian Campeau, Qajaq Robinson. Host: Darren Sutherland.